Plastic jars are defined as any container made of plastic that does not include a handle with a mouth larger than half its diameter. Although most jar tops may be slightly narrower than their base, plastic jars shouldn't be confused with plastic bottles. They are infinitely diverse in design and function. Plastic jars are used to contain a variety of products including perishables, cosmetics, pharmaceuticals, and other non food items. They are an excellent alternative to glass jars due to their durable construction, low cost, and their diverse range of sizes, shapes and colors. Plastic jars are manufactured using an extrusion blow molding process, where hot resin is inflated inside a cavity. As air is injected and the plastic extends to the wall of the mold it becomes rigid and holds its shape. This type of production method is a quick and inexpensive way to manufacture transparent, opaque, and solid colored jars in large quantities. Plastic resins like HDPE, Polypropylene (PP), Polystyrene (PS), and PET are usually used to produce your everyday square, round, hexagonal, and straight-sided jars. Plastic jars will normally be constructed in sizes from .25 oz - 1 gallon. With all the distinct types of plastic jars and containers in circulation, it's easy to recognize why careful preparation must be done before making a purchase. Will you be storing items? Will you be displaying items? How many jars will be needed? These are questions that must be asked before you order. What characteristics should I be aware of when purchasing a plastic jar or container? 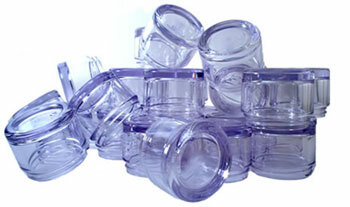 Most plastic jars are manufactured to accompany a plastic or metal removable lid. The choice between a metal or plastic lid will vary depending on the application of the jar. Gaskets may also be added to the lid for a better seal. Manufactured in a diverse number of shapes, sizes, and colors. A variety of resins can be used for different applications. Choice of metal or plastic lids. Inexpensive alternative to glass jars. Most plastic jars can be recycled.